We are lifting up the work of our grant partners through a monthly spotlight series; for our October installment, we feature Legal Services for Prisoners with Children’s (LSPC) project, All of Us Or None. Legal Services for Prisoners with Children (LSPC) organizes communities impacted by the criminal justice system and advocates to release incarcerated people, to restore human and civil rights and to reunify families and communities. LSPC builds public awareness of structural racism in policing, the courts and prison system and we advance racial and gender justice in all our work. All of Us or None, a project of LSPC, is a grassroots civil and human rights organization fighting for the rights of formerly- and currently- incarcerated people and their families. The goal of All of Us or None is to strengthen the voices of people most affected by mass incarceration and the growth of the prison-industrial complex. Joining us to talk more about All of Us or None is Organizer, Lee Bonner. Personally, why are you a part of All of Us Or None? While in prison I was a member of a Prison Outreach Program called (P.O.P.) which was designed for at-risk youth. Instead of juvenile judges sending these youth back to Juvenile Hall and/or the California Youth Authority, youth were sent to Solano State Prison where a team of us serve as facilitators and mentor youth. I saw that there was no follow up on our mentorship to these youth when they returned to their homes. Often, their parent(s) struggled with addiction or had been previously incarcerated, so it prompted me to develop a youth diversion program for them which was implemented, unofficially, on the prison yard. I served 30 years and two months straight inside of the California Department of Corrections and Rehabilitation, On August 17, 2016, I was released from prison. Upon my return, I thought about how thirty years ago the homes in my community were dressed with fresh paint and displayed dark green lawns. But when I arrived in my community of East Oakland, California, I found my neighbors sleeping in tents on the block which we once considered our “turf.” The homes were run down and unkempt, and 95 % of the Black homeowners no longer owned their homes and lived in the community. While in prison, I promised myself that If I ever got out of prison I would go back to my community which I damaged 32 years ago and, to help rebuild it. In my quest to help rebuild my community, Legal Services For Prisoners With Children (LSPC) and All Of Us Or None (AoUoN) helped me understand that it wasn’t just my drug selling thirty years ago was just a small part of what contributed to this present condition, but more importantly, it is systemic issues like criminalization, incarceration, gentrification, and disenfranchisement that have made these problems worse. LSPC/ AoUoN employed me and gave me a political platform in which to combat these social injustices that I and other people on parole face. These injustices also have a direct impact on the youth of East Oakland. What is the vision that guides your work? What will the world – and specifically Oakland – look like if you are successful? The All Of Us Or None East Oakland Youth Chapter is a youth awareness program that works with youth whose parent(s) are currently or formerly incarcerated or who have been impacted by mass incarceration. Teamed with people on parole who can relate to the youth’s particular events leading to incarceration, the caldrons of prison, and the hardships associated with re-entering back into society. As a leader of this Youth Chapter, our vision is to prevent youth involvement in the justice system like the California Youth Authority or the California Department of Corrections and Rehabilitation Systems. Our vision includes training young people to become grassroots organizers, legislative advocates and overall, criminal justice reformers. Our hope is that this experience will offer them a pathway to become community leaders, and reflect what the next generation of Black home and business owners in East Oakland will be. What will you be focused on for the rest of the year? 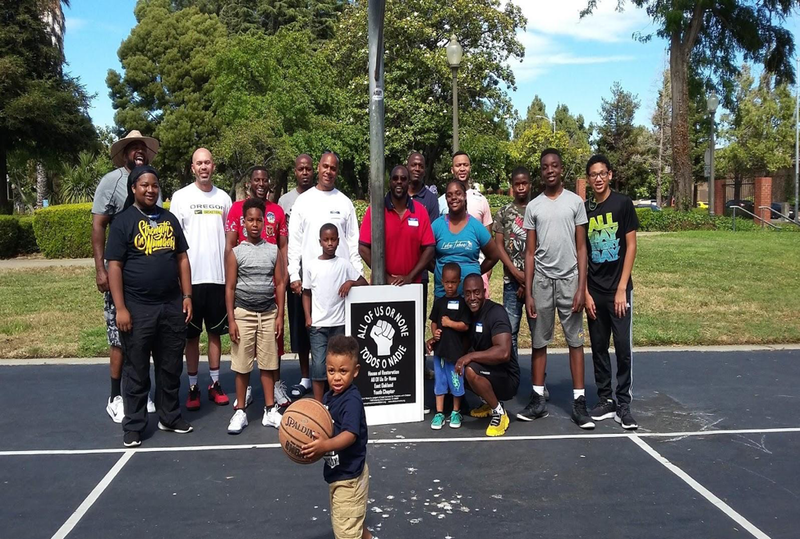 We are developing the East Oakland Chapter’s programs and plans for 2019 to advance the mission of All of Us or None, which includes looking for a consistent space to use in East Oakland to carry out programs and training. We will kick off the year with a community event at Elmhurst Park in East Oakland to educate and engage attendees in the work that we’re doing around our voting rights campaign, the campaign to close down the California Youth Authority in partnership with CURYJ, and our membership program. We are also planning the 19th annual Community Giveback, an annual event that provides bikes and other gifts to children with incarcerated parents on behalf of their parent. This year the event is happening December 8 in Menlo Park. Learn more about All of Us or None here.